The Ruffwear Treat Trader is a waist-worn treat bag that offers hands-free training and quick access to treats. This treat bag features a waterproof liner that will keep greasy or juicy treats contained, while water-resistant shell fabric protects treats from outside elements. The Treat Trader opens easily with the pull of a tab and snaps closed with an audible cue from the secure magnetic closure. 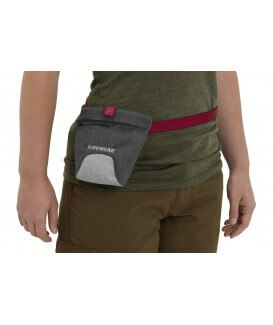 Designed to conform to the human body, the Treat Trader can attach to an adjustable belt (included) or clip directly to the waist.